Companies that provide youngsters to TV shows, movies and other forms of entertainment typically sell them as young adults to third-rate zoos and private collections, where they spend the rest of their lives caged and, usually, in solitary confinement. As a youngster, he drank tea on TV and dressed up as James Bond. When he grew up, he spent the rest of his life at a zoo in the U.K. Louie the chimpanzee died last week. He was 37 years old. Louie was born at the Twycross Zoo, which had already been renting out captive chimpanzees to the Brooke Bond tea company for 20 years. Famous British comedians like Peter Sellers provided the voices for the chimpanzee actions. In his childhood, Louie was part of the acting team, but was retired once he became an adult. Adult chimpanzees are very strong, highly protective of their territory and their mates, and can be extremely dangerous to humans. Companies that provide youngsters to TV shows, movies and other forms of entertainment typically sell them as young adults to third-rate zoos and private collections, where they spend the rest of their lives caged and, usually, in solitary confinement. Fortunately for Louie, he already had a home of sorts at the Twycross Zoo. 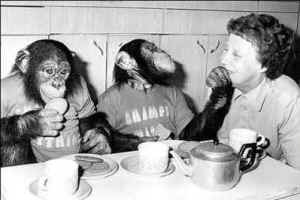 In 2002, the long run of PG Tips TV commercials came to an end, thanks to a campaign from animal protection groups. Chimpanzees still in use went into permanent retirement, mostly at Twycross. By that time, the zoo was already upgrading its facilities to the point where the chimpanzees could live in social groups rather than in semi-isolation. It's a nice sentiment. But chimpanzees like Louie are never part of any family of humans. And no zoo, circus or other institution can ever replace a chimpanzee's true home in the forests of Africa.